If you lived through the 60s as I have you will remember the numerous protests across the nation. 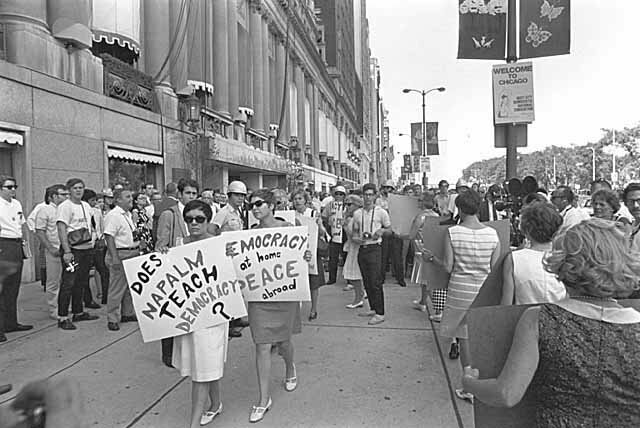 If you lived in Chicago during that time you will remember the local newscasts showing nuclear armament protests, civil rights protests and antiwar protests. At the time of the DNC Convention in August of 1968 downtown Chicago was flooded with protestors. The violent confrontations between anti-war protestors and the police and the responses of Mayor Richard J. Daley were shown on our family’s black and white with rabbit ears every night. The national and local protests appeared to me, a teenager, to be a release of anger, frustration, hatred and anarchy. The protests, in a way, looked familiar. They appeared to a be a rebellious teenager’s emotional response to the authority in his life. The signs, the shouts, the shoves and the protest songs were captured on tape for the whole world to watch and to listen. I said all you got to do is listen. Ironically, as witnessed in Chicago, many antiwar protests turned violent, as protestors incited a civil unrest to make their point about wanting peace in our time. Behind many protests today there is an “It takes a village” mindset that says everyone is responsible while making no one personally responsible except for The Man – an authority figurehead. Making every one democratically responsible then puts the onus for change dangerously into the hands of those elected – the political and religious elite – and away from personal accountability. When those in power are offered more power, totalitarianism follows. The State – The Man – then confiscates your liberty to control those situations and people you want controlled. There are protests that hamstring or hamper others. These protests are meant to cause others to feel the protestor’s pain. 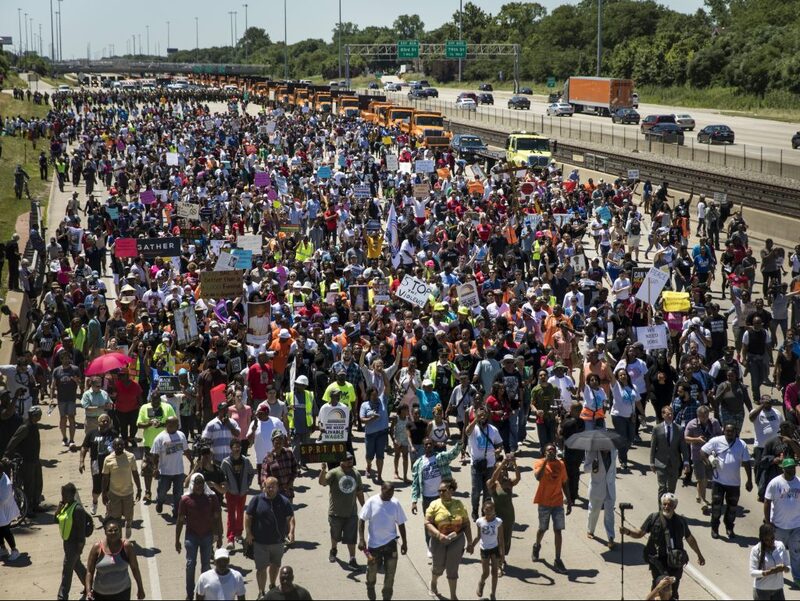 One such protest happened in Chicago recently. Protestors shut down Lake Shore Drive on a Thursday afternoon. They carried signs decrying the ongoing violence on the west and south sides of Chicago: No More Violence Black Lives Matter, Help My Community and Enough is Enough. Violence should be a matter of concern. Yet, in my view, the LSD blockage protest was a redistribution of responsibility for the choices the protestors had made. Consider that most of those protesting were the same people who voted for Chicago’s mayor and city council. And, if you recall, those elected officials made Chicago into a “Welcoming City” allowing in a criminal element composed of drug lords, MS-13 gang bangers, sexual predators, molesters and pedophiles, to name a few generators of imported violence. Consider also that most of those protestors are Democrats who continue to vote for programs that foster government dependence and not self-reliance and responsibility. The pols these protestors vote for offer to assuage fears by throwing money at a problem. And that means raising property taxes, which creates more poverty and more dependence on government, which, by lack of ownership and responsibility, creates more gang violence in neighborhoods. Therein is a Self-Induced Catch 22 for the protestors. There are protests as marches which are meant to be a show of strength, and perhaps intimidation, in numbers. Union protests, the Million Man March and The Woman’s March in DC are these types of protests. In the end the marchers have had their fifteen minutes of fame and then often go on with nothing changed but their Facebook, Instagram and Twitter posts. Many protests are about perceived injustices, inequities and intolerable conditions. As I see it, the cries for “equal rights for all” is often conditional on others being treated unequally. There are protests against personalities which represent The Man. The #Resistance protests against Trump. As they do, have you noticed that many of those who protest Trump’s behavior act as bad or worse than Trump as if by projection of their own immaturity? The #Resistance appears to justify its jejune behavior by saying Trump is The Wrong Man and anyway he should be a better-behaved (but not like those of the #Resistance). Of course, such personality protests are egged on by deep political and ideological divides which are stoked by media personalities who have their own following. Like all else regarding human nature, personality protests are not new under the sun. In Paul’s day there was such a protest within the young and immature Corinthian church. The protest involved personalities Paul, Cephas and Apollos. It seems that these three each represented to the Corinthians a unique style presentation of the Gospel. The Corinthians, eager to take sides, had lined up behind the personality who was the most pleasing to their ears. Some chose Cephas, the hands-on fisherman who had walked with Jesus and could tell tales of his time with Jesus. Some chose the didactic deep thinker and talker Paul and others chose the polished speaker with the locally familiar Greek god name – Apollos. Paul, writing to the church, reprimands the Corinthians for their partisan protests based on worldly wisdom. In my own case, my dear family, I couldn’t speak to you as spiritual people, but as people who were all to obviously merely human, little babies in the Messiah. I fed you with milk, not sold food, because you weren’t able to take it—and you still can’t, even now! You’re still determined to live in the old way! Yes, wherever there is jealousy and quarreling, doesn’t that mean you’re living in the old way, behaving as any merely human being might do? When someone says “I’m with Paul!” and someone else says “I’m with Apollos!” are you not mere humans? Personality protests are self-serving protests. They derive from a person’s worldly human wisdom which generates errant expectations about how things should be – for me. In Mark’s gospel account (Mark 8: 31-33) we read of Peter’s protest of Jesus announcing his coming suffering and death. Peter was expecting a Messiah who lived out Israel’s’ covenant hopes. Jesus now began to teach them something new. “There’s trouble in store for the son of man,” he said. “The elders, the chief priests, and the scribes are going to reject him. He will be killed – and after three days he’ll be raised.” He said this quite explicitly. At this, Peter took him aside and started to scold him. But he turned around, saw the disciples, and scolded Peter. Jesus calls us to a protest that is personal, self-effacing and not world attention-grabbing. In fact, it is the opposite of the social media-grabbing, exploitive and often violent protests occurring in the world today. The violence of the Jesus protest is directed toward one’s ego and fleshly desires and even to one’s self-esteem. We are to sever all claims to self and all protesting rights from our thinking. Be warned if your worldly human wisdom has you say “I’m behind the person that gives me the gospel the way I like it”. Be warned if your worldly human wisdom has you say “I will march for and demand my rights because my rights define me.” Be warned, also, if you protest the Lord’s claim on your life. Jesus, as we read above, warns of a Final Protest where he reveals his total displeasure with your cause to gain the world of self-interest and his embarrassment to be seen with you in the company of heaven.